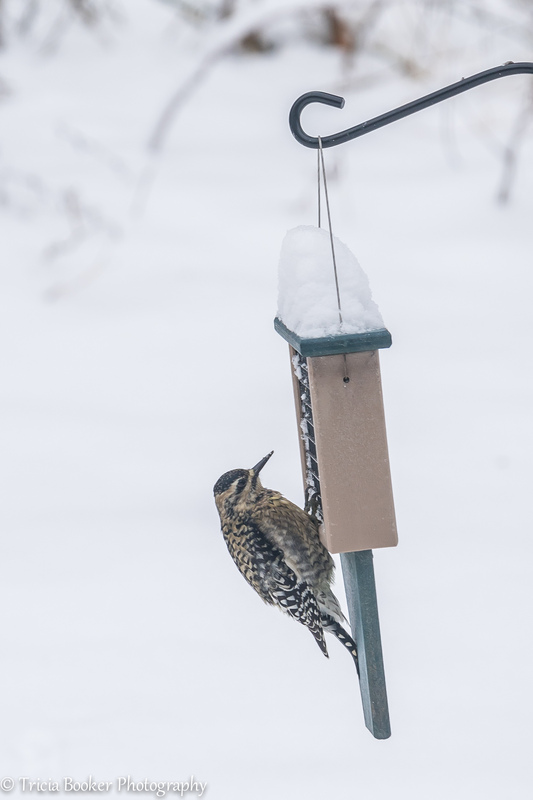 We had the first significant snow of the season yesterday, and with the 5 or so inches came a variety of birds to the feeders. In among the Dark-Eyed Juncos, White-Throated Sparrows, Carolina Wrens and Northern Cardinals was this new visitor. It was larger than the typical woodpeckers we see, such as Hairy and Downy woodpeckers, with markings I didn’t recognize. After grabbing my camera and the Peterson Field Guide, I still couldn’t figure out what it was. More Google searching came up with a few possibilities, including a couple of rarer woodpeckers that would have been outside their typical range, but still nothing really matched. So, it was time to call on the experts and email the photo to my friend and bird guru Amy Johnson. She’s a Smithsonian-Mason Predoctoral Fellow at the Smithsonian Conservation Biology Institute in Front Royal, Virginia, and the leader of the Virginia Working Landscapes bird survey that I participate in each summer. It only took a few minutes for her to email the answer back to me: a juvenile Yellow-Bellied Sap Sucker. I haven’t documented any mature Yellow-Bellied Sap Suckers at the feeders, or even in the yard, so this was a bit of a surprise. But after studying more photos online, I recognized the characteristics I was seeing, including the yellow tinge on the belly. This bird remained in and around the feeders most of the day, so I’m hoping that it finds our yard a nice place to hang out. It would be great if it became a resident so we could watch it mature into its more vibrant mature coloring, with black, white and red feathers. Washington snows are one of the things I miss most in TN……enjoy! There are so many jokes about the “yellow bellied sap sucker!” Your dad would have a grand time with that name!!! Oh yes, the picture is outstanding!!! As much as I like the snow, I’m kind of over the cold. It fell to near 0 last night with wind chills well below that, and school was canceled for the third day. The sap sucker is still here, though. I think it’s enjoying the free meals! Yes, Amy is an amazing birder. She’s never let me down on an ID! The name is entertaining, for sure!